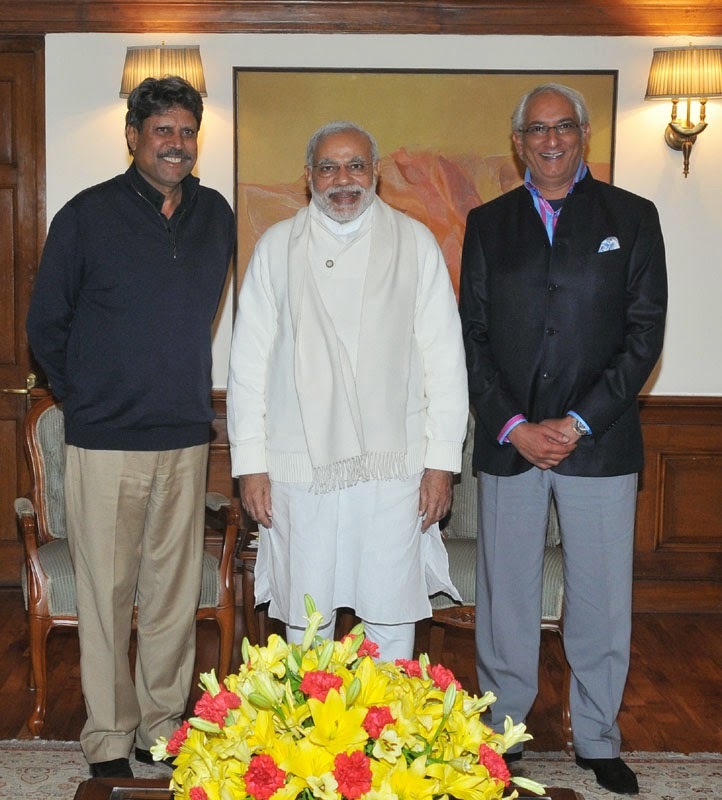 Former Indian cricketer, Shri Kapil Dev, today called on the Prime Minister, Shri Narendra Modi. He was accompanied by Shri Vivek Khushalani, President of KHUSHII, an NGO. 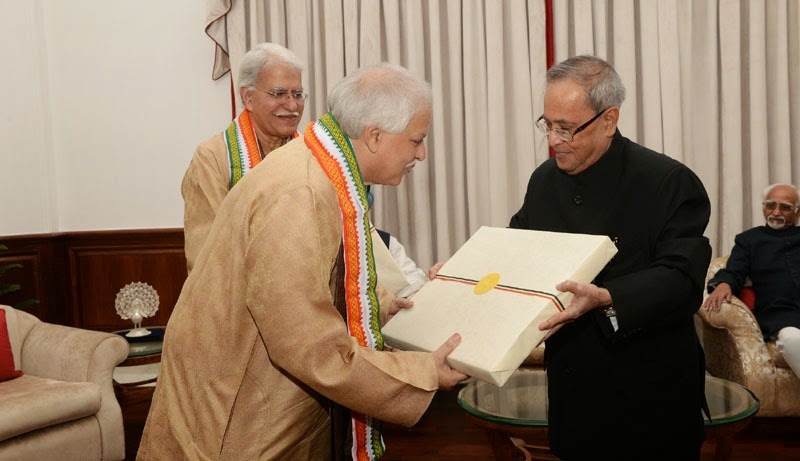 The President, Shri Pranab Mukherjee being felicitated Pandit Rajan and Sajan Mishra after witnessing a Vocal recital performance, at Rashtrapati Bhavan Auditorium, in New Delhi on December 12, 2014. The Vice President, Shri Mohd. Hamid Ansari is also seen. The President of India, Shri Pranab Mukherjee yesterday (December 12, 2014) inaugurated, in the Rashtrapati Bhavan a new Hall for hosting important events. Vice President Hamid Ansari, Prime Minister Narendra Modi, Speaker of the Lok Sabha, Mrs Sumitra Mahajan, former PM Dr Manmohan Singh etc were present on the occasion. Speaking on the occasion, the President said India, being one of the oldest and culturally rich civilizations of the world, claims a cultural legacy which is as deep as it is timeless. Successive Presidents, starting with Babu Rajendra Prasad, have tried to keep this legacy alive by providing the Rashtrapati Bhavan as a platform for the performing arts and their practitioners. The present Ceremonial Hall will take this initiative of revitalization of our culture forward by providing the necessary space and opportunity for our established, as also young artists, to display their performances and works of art. The President said his endeavour is to make Rashtrapati Bhavan a culturally vibrant, dynamic and living hub, reflective of an aspirational and ‘on the move’ India – an India which while progressing rapidly is also deeply rooted in its culture and civilizational values. The President said the construction of the Ceremonial Hall will give us the much needed flexibility to continue with our functions even in times of inclement weather. He expressed confidence that the Ceremonial Hall shall prove to be an important value addition to the mosaic of buildings that comprise the President’s Estate. The Hall will form part of an integrated Rashtrapati Bhavan Cultural Center with an Art Gallery, multi-purpose halls and auditorium. Built as an extension of the existing auditorium, the 55m x 41m Ceremonial Hall has been built keeping in mind the requirements of August 15 ‘At Home’ Receptions and ‘Guards of Honour’ for visiting foreign dignitaries during inclement weather. Among the dignitaries present on the occasion were Vice President, Prime Minister, many senior Ministers, Governors etc. The inauguration of the Ceremonial Hall was followed by a vocal recital performance by Pt. Rajan- Sajan Mishra. The Prime Minister, Shri Narendra Modi will share his thoughts in radio programme `Mann ki Baat` on All India Radio on sunday at 11AM.The Prime Minister will talk about the menace of drugs, this time. "On Sunday at 11 AM I look forward to sharing my thoughts during the #MannKiBaat radio programme. http://www.narendramodi.in/mannkibaat/. As I said during the last programme, this time I would talk about the menace of drugs. http://nm4.in/1sjHeVN #MannKiBaat. Several people shared ideas, comments & insights on the topic which have been both eye-opening & helpful. My thanks to them for contributing", the Prime Minister said. The Prime Minister, Shri Narendra Modi has saluted the martyrs who lost their lives during attack on Indian Parliament in 2001. "We salute martyrs who lost their lives protecting the Temple of our Democracy on this day in 2001. Their sacrifices are etched in our memory", the Prime Minister said.